Countdown to Stagen’s 20th Anniversary Member Reunion! We are excited to announce Stagen’s annual Member Reunion and our 20th anniversary celebration. Every December, our members have the opportunity to reconnect with classmates from their Integral Leadership Program (ILP) cohorts, expand their perspectives on leadership, and engage with over 300 fellow Conscious Capitalists who are committed to transforming the world through business. This year’s theme is: The Fierce Urgency of Now. The conference content and exercises are designed to confront attendees with the existential urgency to act now. 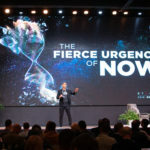 Leaders will be challenged to acknowledge the natural pattern of delaying critical priorities and recognize that later is not an option for today’s most conscious leaders. The time to step into one’s true greatness and amplify impact is not tomorrow, it’s not next year, it’s now. All Stagen reunion speakers are ILP graduates and members of our peer community. Andy Eby, President of Bickford Senior Living and former NFL player, is our opening keynote and is sure to kick-off the conference with a wave of inspiration. His story of discovering his true calling to do “whatever it takes” as a caregiver will set the tone for the conference around the power of conscious leadership. Haley Rushing, Co-Founder and Chief Purposologist of the Purpose Institute, is one of the world’s leading experts on organizational purpose. She regularly engages Global organizations (including Southwest Airlines, Walmart, and Whole Foods) to help them discover and articulate their purpose. She will reveal the power of purpose, as well as the dangers of losing ourselves within it. Jeff Sinelli, Chief Vibe Officer of Which Wich, is anything but complacent. He has created a global chain of restaurants and isn’t stopping there. He’s being called to something else, something bigger, something that is calling him to act now. He will use the reunion stage to announce his next momentous leap. Elyse Stoltz-Dickerson | Eosera Inc.
Elyse Stolz-Dickerson, CEO and Founder of Eosera Inc., will deliver an empowering presentation about finding her authentic voice and true calling. After becoming one of the most senior female executives in a global multi-billion dollar business, Elyse left it all behind to pursue her entrepreneurial journey. Her story is one of urgency, determination, courage, and relentlessness. Dev Patnaik, Founder CEO of Jump Associates, leads one of the country’s top innovation firms. Beyond that, he is an author, professor at the Design School at Stanford, and regularly advises CEOs of Fortune 100 businesses. He will advocate for the importance of constant reinvention and the urgency for building organizational courage in order to thrive in today’s dynamic marketplace. Christina Harbridge | Allegory Inc.
Christina Harbridge, Founder and misChief Executive Officer of Allegory Inc., volunteered to be NASA’s test subject. During her 10 year experience, she gained incredible knowledge about the human body and the interconnected relationship between our physiology, emotions, and brain. Now in the business of helping influential leaders, she will share insights into how to override habitual patterns that undermine leadership performance and effectiveness. John Tobin, Co-Founder and President of North America of Slalom Consulting, will tell the story of what drove him and the Slalom team to build one of America’s Best Companies to Work For. Tobin will share insights into the urgency to create a culture and a home centered around meaningful connection and care. Rick Sapio, Founder of Mutual Capital Alliance, was Stagen’s first client and will close out the 2018 Member Reunion. Having been through the ILP 4 times, his powerful leadership journey has paralleled Stagen’s journey as a company for 20 years. Rick will courageously share his current crucible of transformation and the urgency fueling this personal deconstruction.